Gov. 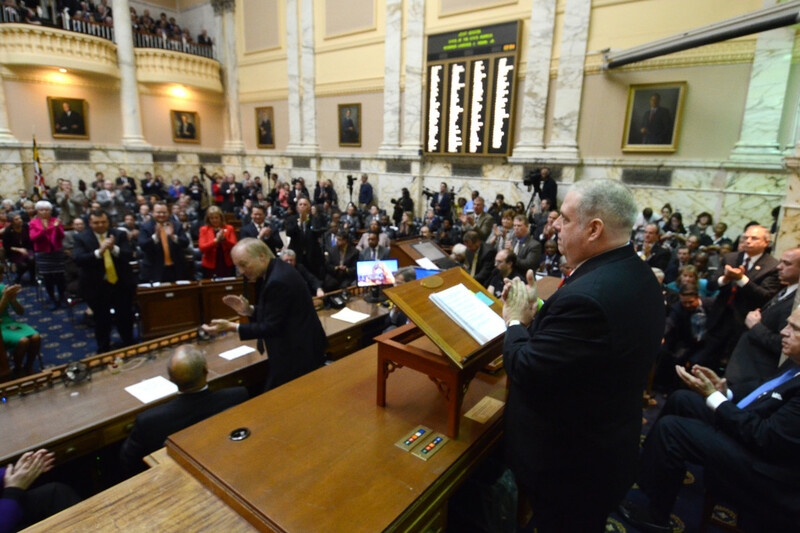 Larry Hogan gives his State of the State address Feb. 3. The ongoing issue of redistricting in Maryland represents one of the most unique political alignments in state politics in some time. Republican Gov. Larry Hogan has found common cause on this issue with not only his Republican base, but independent voters as well as progressive and “good government” Democrats. Liberal special interest groups have endorsed Hogan’s plan and criticized the state’s Democratic leadership. Even the editorial boards of the state’s leading newspapers have overwhelmingly supported the governor’s cause on this issue. Common Cause called the Governor’s proposal a “fair and transparent approach to redistricting to give the people a true voice in who represents them.” The League of Women Voters has made passage of Hogan’s redistricting reform plan one of its top priorities for 2016. The proposal also has the support of a coalition of groups, who are often opposed to much of the governor’s agenda, known as “Tame the Gerrymander”. The Washington Post enthusiastically endorsed Hogan’s reform proposal calling objections of state Democrats “a cop-out”. Confronted with such an unusual and nearly universal alliance against them, how have Maryland Democratic leaders responded? Have they acknowledged the popularity and basic fairness of the Governor’s proposal? Have they admitted that Maryland’s redistricting process is hyper-partisan and designed to keep the Maryland Democratic Party ensconced in power in spite of popular opinion? Have they been honest enough to concede that their opposition to reform is based solely on maintaining a monopoly on control of state government? On all accounts, of course, the answer is no. Senate President Mike Miller and House of Delegates Speaker Mike Busch chose, instead, to defend the indefensible. They have not even taken the Sun’s admonition to “offer intellectually honest critiques” to heart. Recently, President Miller made some remarks about his objections to Hogan’s redistricting proposal. As my Red Maryland colleague Jeffrey Peters points out, his claims raise more questions than answers. While claiming that “No state east of the Mississippi has adopted a redistricting reform plan” Miller ignores independent commissions in New Jersey, Pennsylvania and Ohio. He also ignores advisory commissions in other Eastern states. I have searched in vain for any comments at the time that Speaker Busch was the least bit unhappy with the lines he was so integral in drawing. He had numerous opportunities at public hearings and during the General Assembly’s consideration of the product of his efforts to express such concerns but I defy anyone to find a single criticism he ever made. If the hyper-partisanship employed in drawing Maryland’s district lines really gave Speaker Busch any concern, an absurd suggestion on its face, it wouldn’t appear he let anyone know. Even more telling, though, his newly minted dislike of the product of the redistricting he produced has not caused the speaker to support redistricting reform in the slightest. And so here we have an issue where a Republican governor has the support of the vast majority of Marylanders, the support of even progressive interest groups and the uniform support of the state’s media establishment. In contrast, President Miller and Speaker Busch find themselves opposed by many of their core constituencies and have chosen to rather ham handedly defend the indefensible rather than admit the merits of reform or their own partisan intransigence. It is a rare alignment in Maryland politics. One we have never seen before and likely will not see again soon. While the issue’s legislative outcome may be clear, it is far from certain what the long term impact this issue will have on the political standing of Governor Hogan, who can buffet his bipartisan and good government bona fides, or on leading state Democrats, forced to show their callous self-interest and desire for power over the public good,.